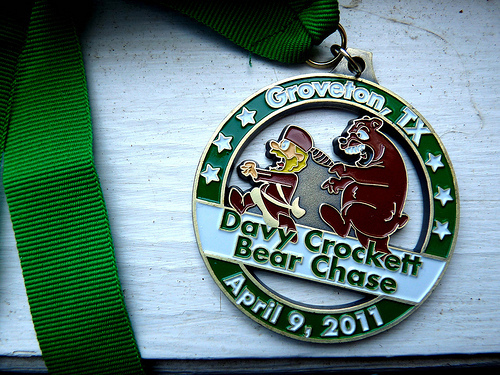 On Saturday, I completed my fourth half marathon - the Davy Crockett Bear Chase in Groveton, Texas. This was my second year in a row running the race, and my second time running with my dear friend and amazing yoga instructor, Amy. 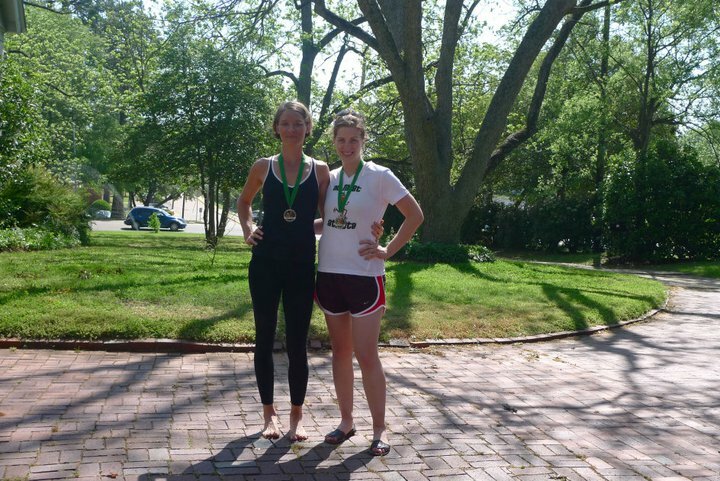 Last year, this race was Amy's first half and my PR. It was chilly at the start and we had trained diligently for two months. I finished in 1:58:21. This year, our training had been less than stellar - as I've mentioned before, Nathan and I were out of town a lot and I ended up missing most of my long runs. Consequently our longest run was ten miles, the weekend before the race. And the temperatures at the start this time around were the opposite of last year's shiver-fest - nearly 70 degrees at the 7:00am start time and fairly humid. I knew a PR wasn't in the cards, but I was still determined to run a respectable race and - most important - have a great time with Amy. 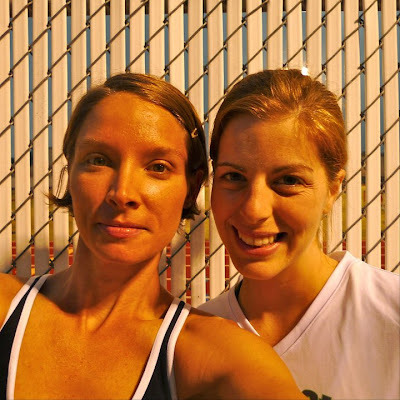 The night before the race was the bi-monthly literary reading Amy and I host at the yoga studio - probably not the wisest scheduling decision. Luckily, the reading was a success and we managed to clean up pretty quickly. I was home and in bed by 10am but that didn't mean I was asleep. Oh, no it did not. I don't know if it was nerves about the race in the morning or energy from the reading or Seamus, who had yet another stomach ache and kept me up with his whining and need to go outside. Basically I got about three hours of sleep, total. Not quite ideal when I had to be up at 4:45, drive an hour and then run 13.1 miles bright and early! But that's exactly what I did. Dragged myself out of bed. Had a whole wheat and flax English muffin with peanut butter and poured a cup of coffee into my travel mug. Picked Amy up and drove to Groveton. 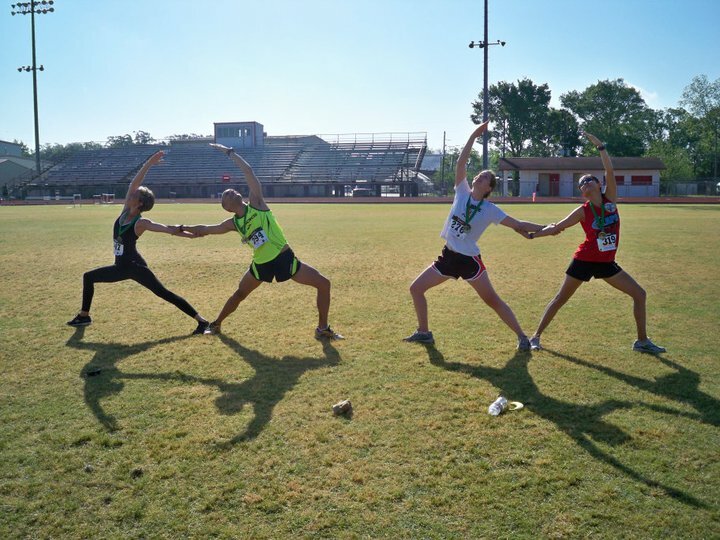 Got our race packets, took a quick pre-race photo, said hello to some friends from the local running group (Go, LAPS!) and before I knew it the race had started! Despite the fact that everyone was anticipating hot and humid temperatures, the weather was actually pretty mild for the first hour of the race. There was some decent cloud cover and the pine trees were tall enough that when the sun did break through, I was able to stay mostly in the shade. 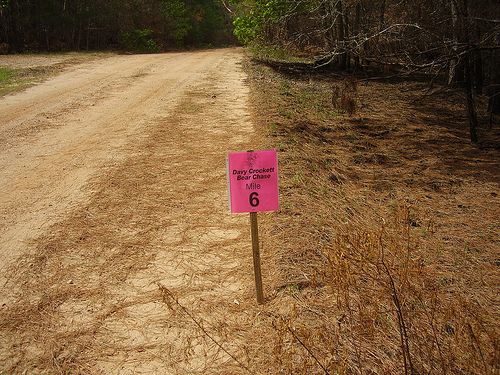 The course was the same as last year, which I appreciated - out and back, with the first 1.5 miles on loose dirt and gravel, about five miles on the road, and then another 1.5 miles into the Davy Crockett National Forest on a sandy trail. Turn around and do the exact same thing again, in reverse, until you reach the finish line. While the course is pretty flat the changes in terrain were tricky. Tricky, but fun! Going into this race I knew I was under-trained and the weather would be an issue, so my goal was to finish in under 2:10. For the first half of the race, Amy and I kept a pretty speedy pace and I thought for a while that I might PR after all. We stuck together for the first 8 miles of the race and had a great time talking about toenails, yoga, the scenery and anything else that popped into our heads and distracted us from the task at hand. When we reached the turn around point, the sand slowed us down slightly and I remembered that last year, this was the point where I had to take a walking break and Amy pulled ahead. Not this year! Just as I began to lose some speed, a woman started talking to us - she was a Marathon Maniac from Indiana and our chatter about different race experiences had me running an 8 minute mile until we were back on the road. Amazing what a good conversation can do! A mile or two after that, Amy started to pull ahead. We had agreed to run the first half together and then each finish our own races - when you're running a race with someone, it's important to discuss this kind of thing beforehand so no one feels hurt or abandoned! I alternated water and Gatorade at all the aid stations, dumped quite a bit of water on my head, and had one gel at the halfway point. Even though I was now running around a 9:30 minute mile, I still felt strong and capable. At about the 11 mile mark, my left knee started to hurt - not super painful, but a strange tightness that wouldn't quit. I walked a few steps and stopped to stretch it, but the nagging pain wouldn't go away. This meant that instead of picking it up and finishing with an impressive-ish sprint, I just sort of jogged towards the finish line, watching the tenths of a the last mile tick away on my Garmin. When I finally crossed the finish line, I was excited to see my time - 2 hours, 5 minutes and 25 seconds! While I didn't PR, I killed my goal for this particular race. Exciting! A new medal to add to my collection! After the race, we walked around, ate peanuts and Sunchips, drank water and posed for some yoga studio photos with our friends Chip and Stephanie. As for my knee, it was stiff and achy for the rest of the day but by Sunday I appeared to be recovered. I don't plan to run until the middle of this week at the earliest, just to be on the safe side. But so far, so good! Overall, I had a great time at the Davy Crockett Bear Chase. 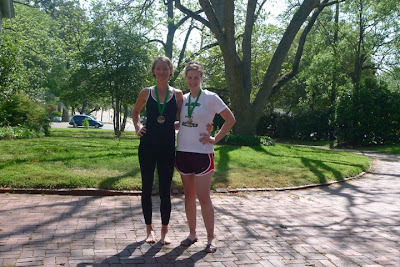 This race is one of my favorite events, and I loved sharing a race experience with Amy (who finished in 1:53. Girl is fast!). Until next time, Groveton!